Thanks to everyone that entered our call for art for the next show at Light Grey! We're happy to announce the list of participating artists! The month of June will be all about decoration, baubles, and items we have and wear that define who we want to be, or the elements we adorn ourselves with that say a little bit about who we are. We're excited to dip into another medium - transforming 2d elements into 3d treasures. 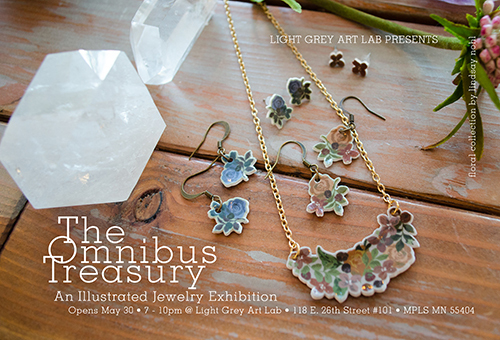 Each artist will be creating a designer collection of jewelry for the Omnibus Treasury. We can't wait!